World War II was going nicely, and Walt Disney's "Saludos Amigos" generally had achieved its twin aims of helping shore up Latin American support for the Allies and propping up Disney's finances. Nelson Rockefeller thus commissioned another effort from Walt Disney Productions with a Latin flavor under the auspices of the Office of the Coordinator of Inter-American Affairs (OCIAA). This new film, "The Three Caballeros" (1944), was put together over a longer period of time and the difference in quality is apparent, with more self-contained segments that place this effort squarely in the "Package Era." Seen as a continuation and expansion of "Saludos Amigos," the 72-minute "The Three Caballeros" is a cut above that earlier film and may be seen as a better sequel to it. Donald Duck is enjoying his birthday, and three friends that he made in South America have sent him gifts. This establishes the framework of the film from which the different segments flow. Setting up film projector which is his first gift (quite a lavish present for 1944! 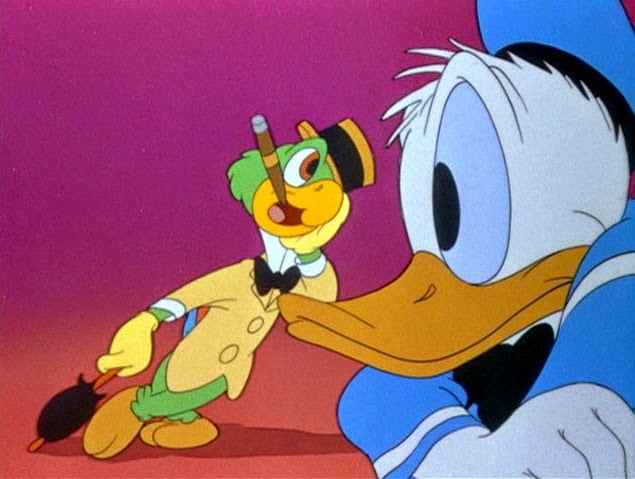 ), Donald settles down with friend José Carioca from "Saludos Amigos" (who is in one of the boxes) and reviews his gifts, which teach him a great deal about Latin America and introduce several new characters. The most enduring character is the Aracuan Bird, who is pushy and aggressive and appears again as a character in follow-up film "Melody Time." 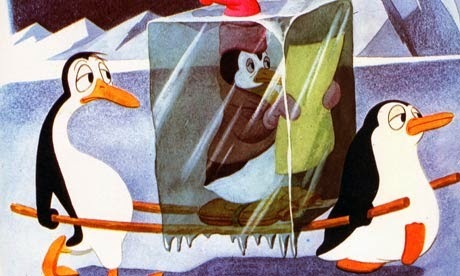 In segment "The Cold-Blooded Penguin," Professor Holloway discusses a penguin named Pablo. Most Americans of the time (and perhaps now) probably had no idea that there were penguins in South America, who live on Punta Tomba in Patagonia, Argentina. Pablo is unhappy being cold and wants to head north, where it is warmer, so he builds an ice boat, but runs into trouble as the weather gets warmer. Next up is a segment about the local birds which, it appears, are mostly made up, including (most disappointingly) the Aracuan Bird. 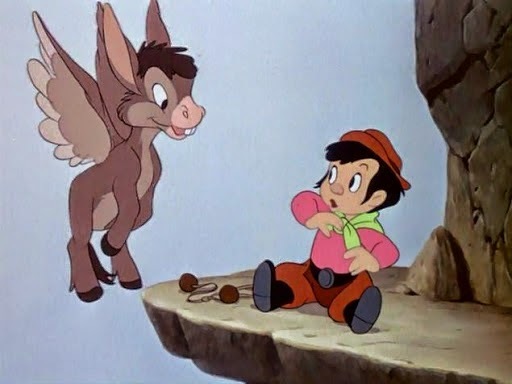 In "The Flying Gauchito," a boy from Uruguay or Argentina (depending on where the film was released) rides around on his winged burro named "Burrito" ("little donkey") and wins a race. In "Baía," Donald Duck and José Carioca meet some women in Brazil who dance the Samba (as in "Saludos Amigos") and entrance Donald. In "Las Posadas" ("The Inn"), Mexican children celebrate Christmas by re-enacting the story of Mary and Joseph looking for "room at the inn," culminating in some fun with piñatas. In the next segment, Panchito serves as a tour guide of Mexico for Donald and José on a flying carpet, or sarape. In "You Belong to My Heart," which is a song title, Donald falls in love with another woman in Mexico City, the song's lyrics telling the story. Finally, in "Donald's Surreal Reverie," which is quite an apt title, a few too many kisses from senoritas send Donald into a love-drunk. This leads psychedelic images of women dancing, disembodied legs dancing, and other odd scenes which the children are really unlikely to comprenden, mixing live action and animation. 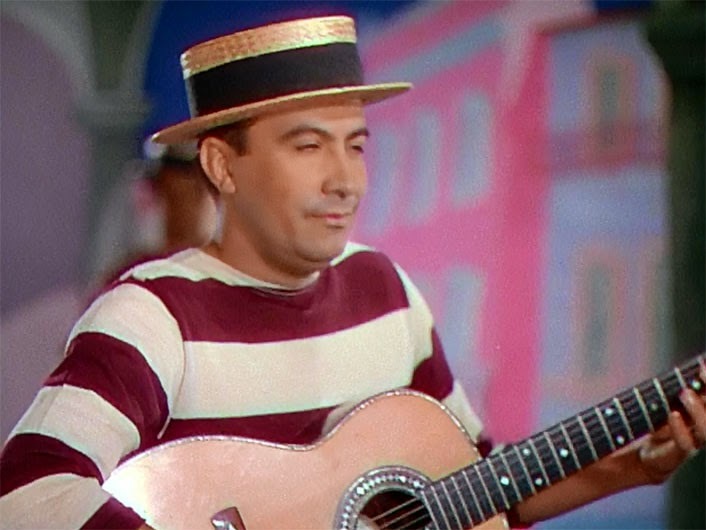 The showstopper of "The Three Amigos" is "You Belong to My Heart," and the weakest section is "Baía," though the accompanying song to "Baía" enjoyed some popular during the 1940s. Each of the segments can stand alone, and some of the characters such as Panchito, José Carioca and the Aracuan Bird are enduring. A malandro evinces his, um, admiration for Yaya the Cookie Lady in "Baía." Go to the Mexican Pavilion at Epcot Center and you can meet them, along with Donald Duck himself, and their images also appear elsewhere in various outposts of the Disney empire. They are undoubtedly the most enduring characters of the Package Era and well worth learning about if you are into animation and Disney. "♪♫ We are three gay caballeros ♫♪"
As with "Saludos Amigos," the real bright spot for "The Three Caballeros" is the soundtrack composed by Edward H. Plumb, Paul J. Smith, and Charles Wolcott. The tunes are original Latin American tracks that were adapted for an international audience. Thus, "The Three Caballeros" was originally composed by Manuel Esperón with lyrics by Ernesto Cortázar, and so on. Each segment has its own unique background music, some of them with deep resonance to various audiences south of the border. 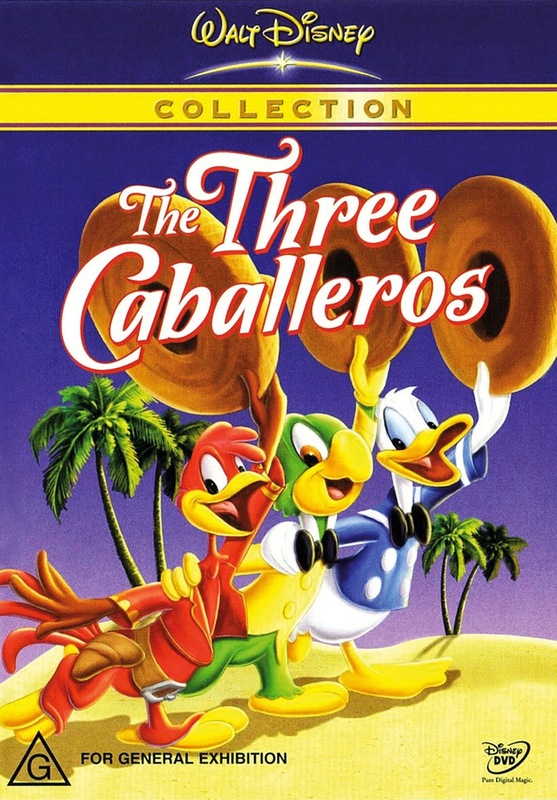 "The Three Caballeros" received Academy Award nominations for Best Musical Score and Best Sound Recording. One thing you will notice right away about "The Three Caballeros" is that it is a film for grownups. Anyone who had any illusions that animation was just something for children would have had them shattered upon seeing this film. 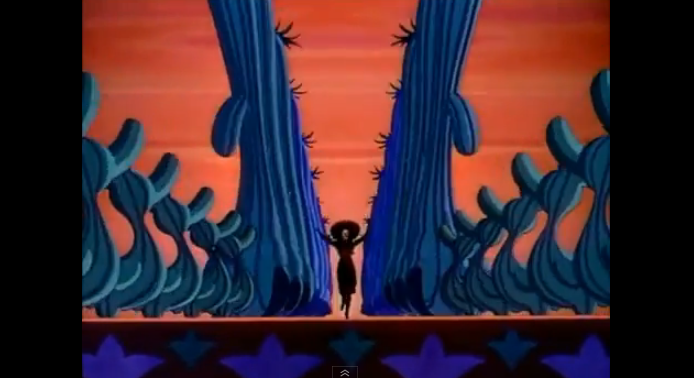 Donald Duck prances about with local women, deeply besotted, while animated cactus twirl around. Yes, it was a more innocent time, which makes this all the more startling and obvious when seen now. There are other scenes susceptible of double meanings, such as one in which Donald looks down through telescope at some Mexican lovelies and his telescope expands and vibrates. The animators were fun-loving guys and pranksters, and anyone who thinks these sorts of things were completely innocuous and coincidences just doesn't understand the locker room atmosphere that could prevail. Even back then, some audience members no doubt got the hint, but it's all just the product of a dirty mind - right? On a more general plane, this is the first Disney film to combine live action and animation, and it is done quite convincingly. These guys may have loved to fool around, but they were the best in the business. The film's package structure is somewhat disjointed, more so even than in "Saludos Amigos." 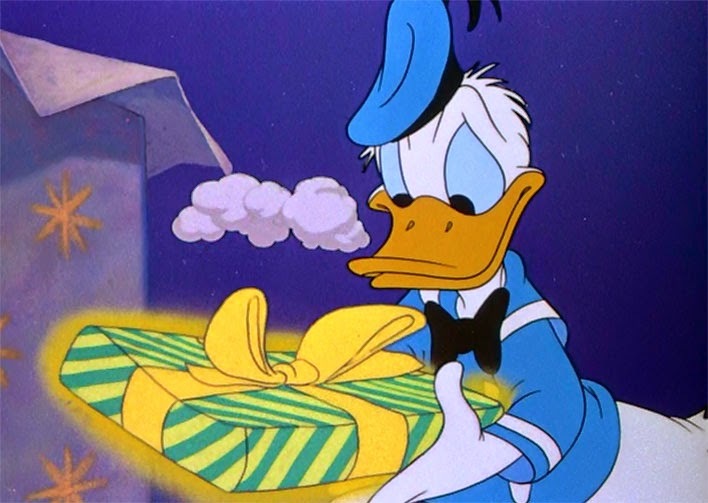 The story hung precariously on the thread of Donald Duck exploring Latin America due to Christmas presents he had received from people he had met their in the earlier film. However, just because the story was a bit sketchy doesn't mean the animation quality was poor. Indeed, quite the opposite. 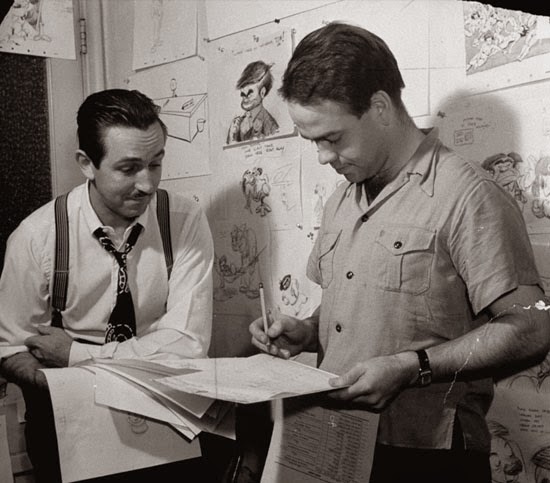 Ward Kimball, one of Disney's favorite animators once recalled that his favorite piece of animation out of all the sketching he had done over fifty years at the studio wasn't anything from the "classics." Instead, it was his animation for the title song of "The Three Caballeros," which had no storyboards and he just went and did it on his own. That's talent. 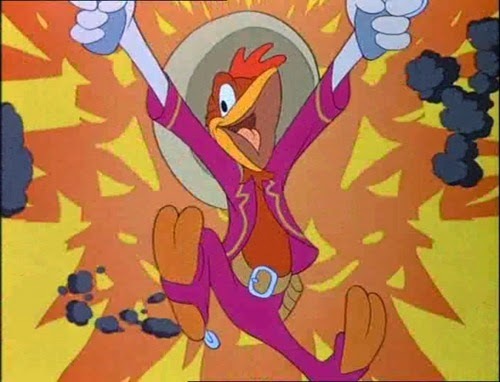 Much flashier than "Saludos Amigos," "The Three Caballeros" also is more cartoony and less inspired, which may partly be because the earlier film was put together during a time of real crisis for the United States, whereas things looked much better for the Allies by the time "The Three Caballeros" was released. Anyone who thinks that the psychedelic era only began in the 1960s or, perhaps, with the original "Alice in Wonderland" in 1951 needs to see that this kind of colorful inventiveness stretches back to "The Three Caballeros." 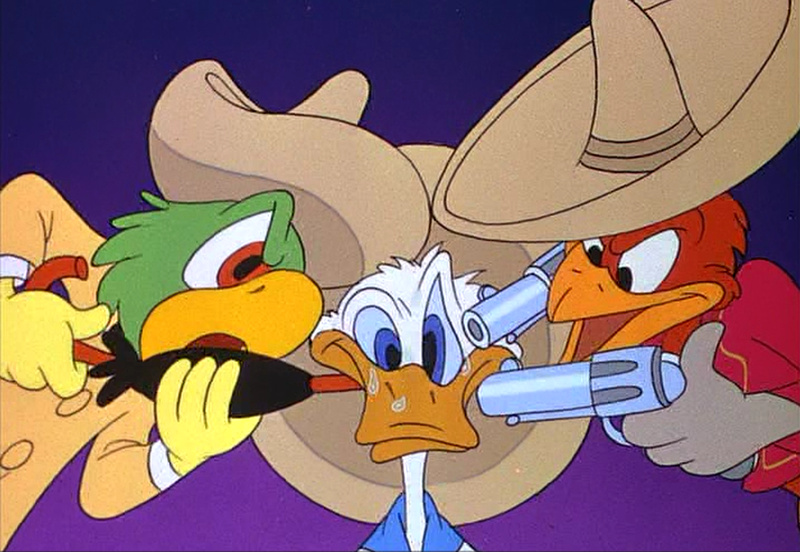 There is a lot of suggestive stuff going on in "The Three Caballeros"
"The Three Caballeros" is well worth seeing, but do yourself a favor and watch "Saludos Amigos" first. You'll enjoy it much better, and if you don't like "Saludos Amigos," that will be your clue that you should skip "The Three Caballeros." They're both quality films, and seeing them back-to-back is the best way to enjoy them. 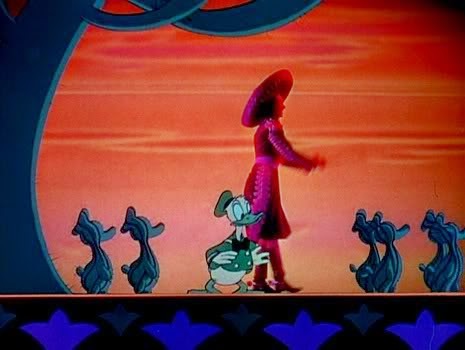 If you are interested, we discuss the sexual imagery of "The Three Caballeros" further here, with additional pictures. Below is the trailer from "The Three Caballeros."